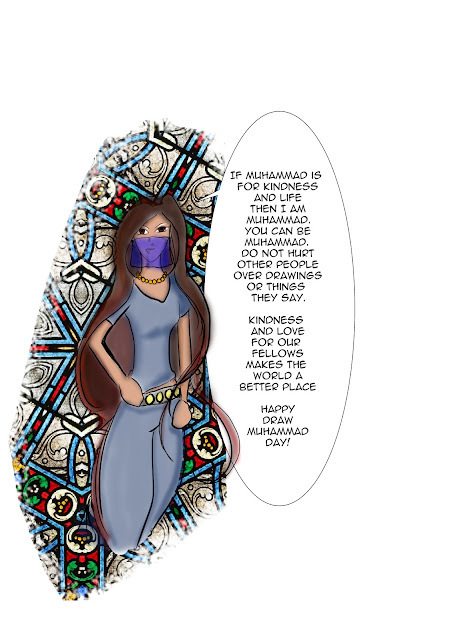 So I totally debated about drawing Muhammad today or not. In the end, people who threaten other people over art, sexual preference, speaking their ideas peacefully... these people who would hurt other people are vicious and stupid bullies, who I could not give my approval to, even if it was just by my silence. It is NOT okay to hurt other people. People have a right to freely explore their voices, their experiences, as long as it does not harm other people. This year I have found a bit of faith of my own, though that little bit of faith means a lot to me, I'm still an atheist. Gods and imaginary friends are good and fine, just don't hurt anyone over them. People are precious and can't be replaced so easily. Love is good for you. Love.. don't hate. Happy Draw Muhammad Day! If he was a gentle and kind person, I expect he'd approve and want his followers to stop shedding blood and breaking hearts.